If you were lucky enough to get your Nexus 5 ordered today, your next question will probably be, “How do I keep this new Nexus safe?” There are now two different cases for the Nexus 5 in Google Play for you to choose from. The first is your standard Bumper Case that covers the back in 4 different colors, black, white, red and yellow, for $34.99. 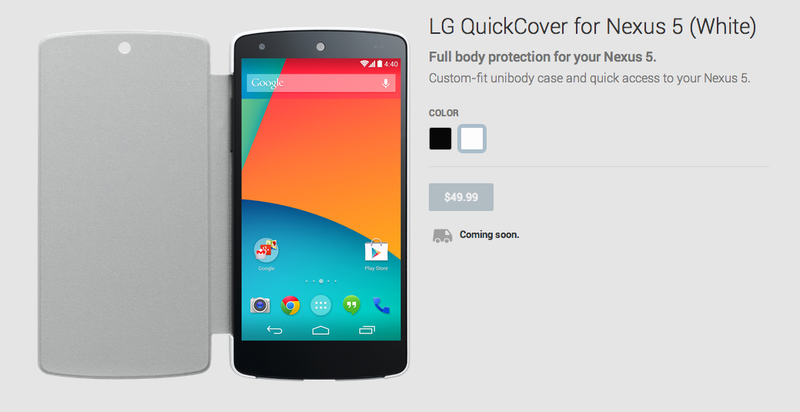 Google is offering a QuickCover case like what we have seen Samsung do with their phones. This case will likely replace or cover the backcover with an attachment that covers the front of the device. This case will cost you $49.99 for the extra protection. Do not get your credit cards out just yet though, Google has yet to announce a date. These are only “Coming soon” for now. We will keep you updated as we hear more.